Question Forum - Summer 2012 - Perelandra Ltd.
Hey! This was great! I'm going to take my dog and go out to enjoy the rest of this wonderful day. DDC's Question: In answer #21 you said the cottage considers December Solstice a non issue, this sounds like good news? Thanks I am really thrilled with all the Perelandra products and procedures, I give stuff to other people. Great Work! Machaelle's Answer: Yeah, rest assured if you have it scheduled to change the oil in your car on December 23rd, don't cancel that appointment! This was a good question to end on. delynhall's Question: What is the best combination of essences to use for natural childbirth - and for a newly born baby (if any)? Machaelle's Answer: Use ETS Plus for Humans for the mom, dad and the newborn. Use the Birth-Stabilizing Process explained in The Perelandra Essences. The Birth-Stabilizing Process will also be available free on our web site next week, in an updated ETS Plus brochure. Beth's Question: Hi! I'm moving to Munich in August... I've been with my MAP team for about five years and just opened a SLG for my new job (Montessori teacher) about two months ago. Will it be just as easy for me to get products? Thank you so much for your fantastic work. Machaelle's Answer: Unless it's only books and papers, our orders shipped to Germany will not get through when shipped from the U.S. You will have better luck ordering from a European country. Here's a list of our international Perelandra resellers. M.S. 's Question: Let me phrase my question another way: are there nature spirits for animals? Since they can move around maybe there are no regional nature spirits for them as there is for plants. And yet it seems a big jump from devic blueprint to an actualized individual animal. So maybe there are nature spirits that work to bring animals into form. Machaelle's Answer: Trust me, animals function with the full devic and nature spirit elements of nature intelligence no matter where they are. It goes with them. Nature intelligence is a single intelligent dynamic that has devic functions and nature spirit functions very much like our left brain & right brain when it comes to animals. naomirei's Question: Hi! Machaelle: I am a Japanese who live in Tokyo. After the big earthquake and Tsunami, I am considering I might use your program to support the enviroment Japan. Do you have any suggestion for the people in Japan? and Japan itself? Machaelle's Answer: A lot of people are using ETS Plus for humans to support themselves in Japan. And many are helping to get ETS Plus and the information out to the people they know. Also, many are using ETS Plus for Animals who have been stranded or exposed. For dealing with radiation, see my Health Watch Bulletin on Japan and Nuclear Radiation here. You can use Essence of Perelandra to support the general balance of your home and land. If you have more questions, contact us at question@perelandra-ltd.com. sgrandt's Question: Not a question but a thank you. One of our cats went in for a tooth extraction but suffered a blood clot that paralyzed his back legs so we made the decision to euthanize him. I followed the instructions in the new Essences book for this situation and it was a great help for getting us all through a very stressful time. We are very grateful for all the Perelandra resources. Machaelle's Answer: I'm really glad I could help, both you and your cat. I was hoping that how I simplified the steps in The Perelandra Essences would help. E.T. 's Question: On question 21, I assume the person was referring to the big 12/21/12 ending of the Mayan calender. You said the cottage folks consider it "a complete non-issue". Is that like the big Y2K (turning of the calendar year from 1999 to 2000) likewise didn''t set off the end of the world or anything much else? Whew, that''d be one less thing to worry about! Machaelle's Answer: You already have made it up by your knowledge and your concern. Sometimes people get a good response from biosolids / sludge, but it's like Russian roulette. It all depends on what's been flushed down the toilet and what's been flushed down the hospital drains the day that sludge was processed. More often, there is a high degree of toxins and heavy metals that constantly build up in soil. JM's Question: Many of the questions posed to you seem like they could be answered by Nature itself. After all: you give us enough tools to communicate.... ;-) THANK YOU FOR YOUR ESSENTIAL WORK! Machaelle's Answer: Sometimes it helps to hear a human say it. And you're welcome. shantimikel's Question: Re Ksamour's question (#30): For clarity's sake do you mean one can keep MAP emergency coning open for two weeks (if needed)? Machaelle's Answer: You can keep Emergency MAP open for as long as it takes for you to have the energy to switch it over to your regular MAP program where you are opening and closing the coning. So yes, you are correct. But don't turn into an Emergency MAP junkie and assume that if you're having a bad day it's okay to keep an Emergency MAP coning open for the next three weeks. It's for emergency and serious situations only. petirrojo's Question: Hi--didn't think I'd ask a question here, but here goes. Two questions--what is best way to handle ongoing stress from combo of job, relationship and care of parent and is it feasible to help my parent who is 85 and experiencing ongoing recovery from surgery/cancer 1.5 years ago. She is also experiencing memory loss and changes of mood and not necesarily open to MBS's. Machaelle's Answer: For the best answer for your situation and combination of issues, I think it's better to talk to the Question Hot Line (Jeannette's answering until 5 p.m. today at 1-540-937-3679). Lila 's Question: Hi Machaelle, Since I have had such incredible success with the Perelandra processes (especially MAP, thank you, thank you!) over the years I am wondering why we need a national healthcare system that I would have to pay for, but probably not use. Currently I support the man, not the program. Any thoughts? Machaelle's Answer: I understand what you're saying. I haven't needed a traditional or a conventional part of the health care system in 35 years, but I still have insurance because accidents do happen and I may need emergency care. It's statistically proven that medical care is likely needed in the last six months of life and I am planning to die at some point. I have always recommended that people not shy away from using conventional medical practices when they are needed, such as surgery. Even though the Perelandra processes and products do a great deal for your health they can't reset a broken arm. I always counsel that we be smart about balancing between the two -- conventional and cocreative. Mark's Question: Hello, sometimes when I am in a coning and after I have closed a coning I feel extremely spaced out. While in the coning I do use ETS for humans and I also use it after the coning. Is there anything else I can do to help me stay balanced? Machaelle's Answer: Use Essence of Perelandra (EoP). And, the next time you open the coning, tell them that you're having a reaction and request that the coning stabilize you as it's closing down. That should take care of your spaciness. M.S. 's Question: Hi Machaelle, When working in my garden, I understand that I'm working with the deva and the nature spirits of each plant, as well as with the deva of the garden itself. When I'm working with my chicken flock and bee hives, I understand that I'm working with the deva of honeybee and the deva of chickens, as well as the devas of my flock and my small apiary. Am I also working with local chicken and bee nature spirts as well? Machaelle's Answer: If you use Pan for the nature spirit point of the four-point coning, you've covered all your bases. mtngrybr11's Question: I have progressively more C02 in my blood, which means I have less oxygen, and probably am having breathing problems. Also, I am becoming more sensitive to some foods, like wheat, oils, corn, and more. Is there an essence or essence combination you would recommend for my problem/imbalance? Machaelle's Answer: I suggest starting with the MBP Balancing Solutions for the Immune, Lymphatic, Cardiovascular and Respiratory Systems. I also would recommend Eat Right 4 Your Type. Martin's Question: PS: I’m re-reading Co-Creative Science in more detail again. What a great instruction book with so many important and helpful details! Somewhere in it says that CCS will first and foremost improve your life.... No kidding!!! Big tip of the hat to you and your cronies! Machaelle's Answer: Thank you for the kind words. Machaelle's Answer: A) No, follow the step as it's written. B) She's your girlfriend. Give her a gift of a 1/2-oz. bottle of EoP to carry with her. For other's projects they need to get their own EoP. C.W. 's Question: Can one use the Soiless Garden process in finding and alleviating the causes of relationship issues when in a group setting? If so, how might that process go (generally)? I am thinking more of what I need to alter or release than anything. Thanks! Machaelle's Answer: This is not the most effective use of SLGs. To address what you need for that kind of issue, I recommend MAP and I recommend the Perelandra Essences. If you need help in setting this up, call the Question Line. Columbipaw's Question: Fukushima - out of sight out of mind - some minds (several meanings!) Any tiny thing we as individuals can do to aid Nature in maintaining some kind of balance there and on it's global impact? Machaelle's Answer: There are groups of people working with Perelanddra products who live in Japan who are working with this. So that's being taken care of. I usually recommend that people not think in terms of applying co-creative science to the globe, but rather applying it to their own lives and their own land. It's much more manageable, and helpful. Thomas's Question: Just wanted to say also that I've been using ETS Plus not just for physical pain but for emotional pain and mental self-abuse as well and it helps with those things tremendously as well. If I notice that I'm beating myself up for any reason or if I have "broke-up with my girlfriend" pain, I take ETS Plus and it really helps me get through it. Thanks so much for this! Machaelle's Answer: I'm glad it's helping. And here's to finding the right girl! Thomas's Question: I'd like to use ETS Plus in my Hot Yoga class whenever I manage to hurt myself, but I'm worried that the heat (100 degrees plus, at times) will damage the ETS Plus during the class, which is an hour long. Is ETS Plus durable enough for a Hot Yoga class? Machaelle's Answer: Okay Thomas, Beth just explained Hot Yoga to me. Go ahead and use ETS Plus with no worry. It's stabilized for heat a lot hotter than 100 degrees. ksws's Question: Thank you for your amazing insights, products, the expanded awareness you've triggered, and the pioneering you do! Here's my newbie question: If I have a business partner and we want to start a soil-less garden together, but we are not in the same physical location, can we do our SLG conings together over the phone or skype? Machaelle's Answer: You can, but both of you need to open the same coning at the same time. You both can construct the questions to wish to ask, but to avoid confusion only one of you does the kinesiology testing. If you have more questions, you could contact the Question Hot Line on any Wednesday (or today until 5 P.m.) at 1-540-937-3679. Thank you for the kind words. Machaelle's Answer: Thanks for the nice words, but . . . what new book?! ksamour's Question: I broke my arm on the 4th backpacking. Opened a MAP session overnight. Pain much reduced. Now back in civilization; dr visit & surgery next week. Pain getting bad. Open a coning? How much to keep open?? Machaelle's Answer: Oh, I feel your pain. Open an Emergency MAP session and keep it open until the pain subsides after surgery, or about two weeks after surgery. Verbally let your team know when you are experiencing pain or any other discomfort, and what the schedule is for surgery. Plan to take ETS Plus for Humans 5 times daily until after you stabilize post-surgery. This combination will help not just with the pain, but also with the repair and recovery. Travelboy's Question: Machaelle, I am so appreciative of all that you do. The processes and essences you co-created have changed my life and, really, woo-hoo! Thank you. OK, I hope you don’t think this is a silly question, I just want to save some paper! When I do the Energy Cleansing Process, I draw a circle. Almost always, I write ‘project framework and mental-level activity’ inside the circle. And then, after the process is complete, I throw the paper in the recycling bin. My question is: is that piece of paper now ‘used up’, like after shifting ETS+ in a NS application, or could I re-use it the next time I do the process? Machaelle's Answer: You're welcome to use it the next time. And the Deva of Trees thanks you! The actual process is focused on the ETS Plus and the project framework, not the piece of paper. The circle with the words is just to set the board from which you and nature are working. huimalu's Question: My partner has been using Cardiovascular, Immune, Repro-Male, Endocrine & Lymphatic for about 8 months. At first, it helped stabilize his blood sugar (type 2 diabetes) and he shed a small amount of weight. This was the case for about 3 months. He has still been taking them, but his sugar is not stable even though there has been little other changes. Any suggestions regarding this? Please note, I am not asking for medical advice, diagnosis or prescription. Thank you. Machaelle's Answer: If you're open to it, I recommend that he expand his Perelandra health tools to include MAP. Let his MAP team help stabilize him. He's going to have to describe all of the health issues he's address to them all. gaeashaw's Question: Hello Machaelle, I recently started using ETS+ for Humans with coning. I am a heart transplant recipient of almost fifteen years, and at this time (LOL) my heart is out of rhythm... an electrical issue! The first coning I did was profound. The best part, and there were many, was that fear left, and has not returned. I am very grateful for the gift of MAP. I have two questions: I read that other people and pets should not be near me when I cone. Sometimes that is difficult to work out. I did a coning last week with my dog in the room but about 4 feet from my feet. The coning was wonderful as always, but is it a detriment for a pet to be in the same room? AND, I cannot afford to buy many products, but if you have a strong recommendation for something other than ETS+ for my heart/medical situation, I'd like to know. Thank you! Machaelle's Answer: I would recommend that you include the MBP Solutions for Immune, Lymphatic and Cardiovascular. You would take these twice daily, first thing in the morning and last thing at night. Just make sure people and pets are no closer than 3 feet when you're having a MAP session. Columbipaws's Question: My mother had many strokes and my work with MAP has greatly lessened my own fears - and, can you please recommend which MPBs for keeping the body balanced to lessen the chance of having a stroke. Thank you for everything, Machaelle, and everyone at Perelandra. Machaelle's Answer: For the MBPs, she would take Immune, Lymphatic and Cardiovascular. Tell your MAP team that you want them to deal not just with your fears but also balancing any weakened parts of your body that might lead to a stroke. You didn't mention the Perelandra Essences, but if you use them, do the telegraph test checklist focusing on areas that need strengthening that might lead to strokes. Healingway's Question: Hello All I have had this question for some time,I have dealt with it instinctually and now I wish to get input. On some of the essences there are instructions for how many drops - since I have both large and travel size dram bottles the drops are signigicantly different in volume. My question; shiould the instructions for the number of drops change based on the dropper size used? Thanks, Have a wonderful day all. Machaelle's Answer: The size difference of the drops from a half-ounce or a dram (1/8-ounce) bottle doesn't matter. Eric's Question: How often can you open a coning when working with a soil less garden. I stabilize and balance sometimes daily, is that ok? Machaelle's Answer: That's fine. You can open a coning as often as you'd like. Just as long as you're not becoming an addicted cone-head. Lawrence's Question: Hi Machaelle, I've been sitting here for 3 consecutive VOHs and finding every question I can think of can be handled by my MAP team, SLG etc etc. It seems your system is working! I think I have something for you now though. I am an energy medicine teacher and part of my curriculum is teaching students about bringing balance to their lives and their relationship with nature, often using Perelandra tools. Are there specific planetary issues (aside from personal balance) that are particularly hot items in your view that would make good class SLG projects as service work? Everything is so out of whack it's hard to prioritize what to work on - hoping you might have some insight. Thanks! Machaelle's Answer: I have a hot issue that is a burgeoning scandal, particularly in the United States. That is the issue of land-applied sewage sludge, commonly labeled as Biosolids. It is dangerous. It destroys land. It can kill livestock. It can cause serious health problems for humans and, for the particularly vulnerable, even death. It requires a serious push on educating people about the problem. Because the simple solution to the problem is for people to simply say, "No." when sludge companies ask if they can spread it on their land for free. The soil-less garden around this would be effectively educating people around the problem. It would be focused on both Class B sludge as well as Class A sludge. I have an extensive paper on this that you can read at no cost on our web site here. It allows your class to focus on one thing, but it has a very broad impact. Thanks for asking this. Andrea's Question: Hi Machaelle I would love to do the MBP but I am unable to source many products needed for the soil balancing kit. The kit wouldn't get through customs here in Australia, and I am unable to find equivalents. Do I test to see if substitutes can work? Being at the opposite end of the planet from you I can say this without getting walloped. You're not the first person in Australia to have this difficulty. Some people are not having the difficulty. Search the internet to see what's available in country. You might be able to mail-order it from another location. I would try this before I would start testing substitutes, particularly since some Australians have been able to solve the problem. If all else fails, you have no choice but to test with nature for substitutes. MaryRose's Question: Hi Machaelle. It has been a wonderful and wild ride with following your lead for the past ten plus years. I have two questions and I hope that you'll humor me by answering them both. My first deals with my most recent SLG: Do you think that nature responds as intently for issues dealing with finances and abundance? I've been having regular meetings but am a LITTLE nervous about what happens in our "real" world and my bank account. Perhaps I'm impatient. My second question is...(drumroll) What do the cottage folks have to say about what can occur during our winter solstice and after, this coming year? Thanks for your most respected input! Machaelle's Answer: Nature responds equally to any SLG or any situation. You don't have to worry about that. But you might want to do essence telegraph testing for your nervousness about the "real world" and your bank account. That could be the thing that's gumming up the works. The second question: This is going to soo disappoint you, but the Cottage folks aren't discussing this at all. It's a complete non-issue. Helka's Question: Hello Machaelle, After the removal of a cancerous tumor from my bowels at the beginning of May this year, I’m now wondering, if telegraph testing the reason for the tumor (which I’m not quite sure about) would be the appropriate thing to do next in light of the cancer issue as a whole. I’m glad that my health report based on a pathologist’s statement after the operation is clean and that I don’t need any chemotherapy. After I got home from the hospital, I’ve been doing ‘telegraph testing after surgery’ as instructed in The Perelandra Essences. What else would you recommend? Machaelle's Answer: This is good news. I congratulate you and your body. I don't think it hurt if you also did a telegraph test for the underlying situation on all of your PEMS levels that resulted in your body developing cancer. If you try to reduce this to an emotional cause, I'm concerned that you've narrowed the focus too much. Let the telegraph test walk you through this labyrinth. I'm just really pleased with the pathologists statement. Karen's Question: Hi, Machaelle, No questions today. I just want to say thanks. Your essences and the procedures to help us connect with Nature in such co-creative ways are a wonder. I LOVE taking the essences, and sharing them with others who benefit from them too. Everytime I take EoP and the microbials. . .I just fill with gratitude to you. . .to all of you at Perelandra. You have a fabulous staff of friends. They are so helpful and patient. Kudos to all. You make our journeys easier and much more fun!! And I LOVE the Natural Aging solution. Inspired! Thanks! Machaelle's Answer: Wow! Thanks for the kind words. I'm very pleased at how well you're working with the products and that they are making such a wonderful difference in your life. Robertson's Question: Hi Machaelle I have been trying to think of the most awkward and off the wall question just to wind you up but I know the flat earth society will probably cover that. So here is a normal one, are you going to write any more books, continuing your adventures as a co creative scientist? Machaelle's Answer: Wait! I think you tried this before! Please stop encouraging the flat earth society people. I'm holding on pretty good here. Until I got to your last sentence. What you crazy person, do you think I'm sitting here in Tahiti drinking Mai Tai's? Of course I'm continuing my adventures. And just hang on, you never know when I'm going to come out with something. Mostly because I never know when I'm going to come out with something! Machaelle's Answer: It sounds like you need to get this out of your head, so I would suggest creating a small co-creative garden and work with nature as a Gut Gardener. M's Question: How specific does the title of an Essences Telegraph Test for Emotional and Mental Issues need to be? I want to use the process for trying to release issues that have been troublesome for years, and I want to make sure I don’t leave anything out. If I called it, say, "I don’t deserve success" or "I’m afraid of abundance," is that too wide-ranging? Machaelle's Answer: Go ahead and use this process as it's set up. You're going to be working with the wide-ranging focus as well as the specifics that you are aware of that are a part of that wide-ranging focus. Coming at it from both angles is something that I think will work well for you. Barbara's Question: I have a wonderful new position, also in Hospice, a more supportive environment for my work. Thanks to my team it fell into my lap. Now I am ready for another relationship - can it be a soiless garden? Thank you for this incredible help and support I really appreciate you all. Machaelle's Answer: I wouldn't suggest it, but you can if you want to. You can't focus it on a specific person. Focusing on your responsibility in a relationship and not anyone else. Lemonpick's Question: new book coming? subject? or say something about? Machaelle's Answer: It's my policy to not talk about anything that isn't already offered to the public. Machaelle's Answer: Hey you two! Hi! We're using the distilled white vinegar that nature wants used as the preservative. There's nothing we can do about the acid content. But have you tried The Perelandra Salad for your MBP Solutions? Machaelle's Answer: If you're feeling a sense of turn-around and breakthrough beginning, then my advice is that you just keep following your own nose. You seem to be stepping through this. So go for it! Michelle's Question: Hi Machaelle, no question today just deep and heartfelt appreciation. So many times when I am working with nature, I feel such gratitude for this work. I feel so grateful and relieved that I can work in this way with nature. Thank you! Machaelle's Answer: I'm really glad to see how well you're sticking with the work, and I feel certain that nature's glad too. Thanks for checking in. SpiritoSpirit's Question: I am overun with grasshoppers inside & out; trying a soiless garden coning. Any advice greatly appreciated! Mary's Question: Greetings Machaelle, Thank you for everything you do for us. I have been doing the EoP nature shift as you proposed in your 4/22/12 email on a monthly basis. I do it in 4 steps: front yard, back yard, garage and house. Since doing these shifts, & then setting up an Energy Cleanse later on, no essences come up for the EC. There is not much negative energy in my house & I am thinking perhaps all I need do each month is the EoP shift. I would appreciate your thoughts on this. Thank you. Machaelle's Answer: Mary, you need to check with nature on this to find out the way to go. And then go that way! 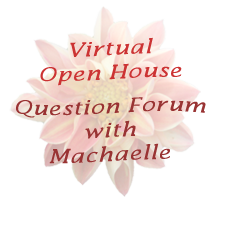 Jack's Question: Hi Machaelle Question: Often times when I am using a Microbial balancing process on a plant or a soil-less garden, I feel a lot of changes taking place in my own physiology and consciousness. Is this just a 'part of the process' or is there some specific use of the processes on my own physiology that would be a good preparation? It seems like while treating something 'external' there is 'internal' treatment going on as well... Rave: Just want to say that I'm so appreciative of the products and the groundbreaking research you have done over the decades. I've been using your products and processes since the late '80s and they are always of the highest quality and integrity! Machaelle's Answer: It's quite possible that as an external process is going on, you are internally adjusting. I would just go ahead and let it happen. If you're concerned in any way, you could take a dose of Essence of Perelandra (EoP) before you do the process. That might eliminate your internal adjustments; they are not necessary to the process. Thank you for the rave. I really appreciate the kind words. Machaelle's Answer: It's a poster that acts as a tensor energy antena. Unfortunately, they are no longer produced or sold. schmidmd's Question: I'd like to use one of the ETS products for my lawn - there's been no rain for many weeks and I just want to say hang on - it's cloudy and windy now with 90% possibility of Tstorms . . . possibilities. Which should I use, ETS for Plants or Soil? Machaelle's Answer: Personally, I'd just let it rain and consider this part of the natural rhythm of things. But if you feel better by doing something, use ETS Plus for Soil. Trudy's Question: Hello Machaelle Is it possible the Natural Aging putting in a 8-oz. bottle? A lot of users in Holland wants to have an 8oz family size. Thanks a lot all of you Perelandra people. mimkell's Question: Is this a print only forum rather than video? Shirley's Question: Hi, Machaelle ~ Do you count bumping the tip of the glass dropper on the rim of the essence bottles as poor dropper hygiene? I'm forever doing that with the little dram bottles. And secondly, is there a way to check the full dram size box of essences to see if any of them have lost their integrity over the years due to the above dropper bumping or anything else? Thank you so much for doing these regular question and answer bits. They are awfully helpful. Machaelle's Answer: As long as you're not bumping the dropper from one bottle with the lip from another bottle, you're fine and no integrity has been lost. Machaelle's Answer: I'm very pleased for you. And I'm glad I could be a part of your adventure!